Harvest is just around the corner: not just in the movement of time , but there seem to be vineyards popping up all over this lovely state. In the past few weeks I’ve had the privilege to visit a few, and I am amazed at the diversity of training systems and also the choices of where people establish them. 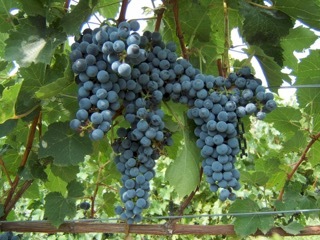 Traditionally a vineyard owner will seek out a winery and ask what varieties the winery could use, and how much of each. We are in a period with some new things coming out, and a few vineyard owners have made choices to get a step up on other growers by following trends–not set by the winery down the road, but by the winery on the other side of the world. We only stick our heads in the sand if we, as vineyard and winery owners, don’t recognize that worldwide trend. As growers and winemakers in the Northern Great Plains, we must first answer to the local market. But where does that local market stand? They’re standing in front of a shelf in their favorite wine store, grocery store, or liquor store, and looking at a thousand different labels from a hundred different growing regions, and realizing that the world is starting to look a lot more like what we’re doing here. If you look closely you will find Cabernets, Merlots, Chardonnays, and almost anything else from bone dry to very sweet–the whole world is becoming westernized. We could have a discussion of what this is doing health-wise to people who once had a diet of mostly healthy foods, and who now consume, well, let’s call it a diametrically opposed diet to the aforementioned one–this is not the time to step on toes. With that in mind, I think we have a distinct advantage over some of the rest of the world, in that we not only can produce any style of wine available in the world, we have new flavors in many of the grapes we have, which are not being used in most other places in the world. We can now look back on those forward thinking growers and applaud them for their guts and seeing something that makes this all very exciting–and fun. Capitol View has that same vision. The wines here will evolve with the growers, and most especially with the new varieties that I will be releasing in the coming–not far off–years. How far you can take something in your lifetime is directly tied to your zeal for change, not fear of it. The good thing is: you don’t have to go it alone. As we strive for the noble things in life, we attract others with like minds. Okay, that sounds like way too much fun, I’m glad it’s already in the works. Something else that’s been in the works is our “Vintner’s Reserve,” and we’ll be releasing it August 11, at 6:30 PM. Check out the event calendar for the details. I’ll be milling around to answer any questions you might have on the wine, or whatever you like. Trish and Les told me to blend to my hearts content with this one, and so I did. It has some of my Temparia in it, as well as some of my favorite selections out of my grape breeding program. There will be some light appetizers for you that were selected to pair specifically with this wine. Anyone that read about the grafting in a previous post–along with the previous photo–will be happy to find that the growth of that one bud has now completely filled it’s space on the trellis, and has the potential of putting on a full crop next year. By the way, the photo you see for this post is my Temparia, which is used in this wine. Hope you can make it on the eleventh of August, it’ll be a great time.